Kong: Skull Island is a smash hit at the box office, and sets up a larger monster universe that will include Godzilla! In Walmart stores now are the brand new toys based on the film. Blake Noh of Lanard Toys has released an in-depth behind the scenes look at their Kong: Skull Island toy line. 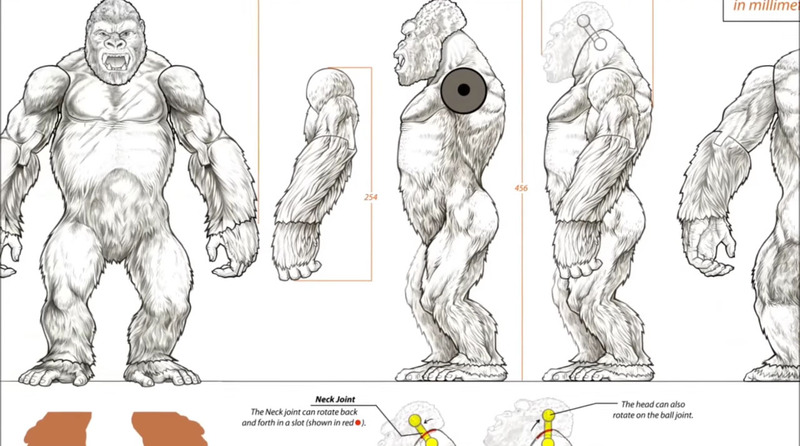 The video takes fans through early development, sculpting, packaging and more. You can see early development sketches, their approach to digital sculpting, refinements and even 3D printing used in creation of the figures. Check it out below. 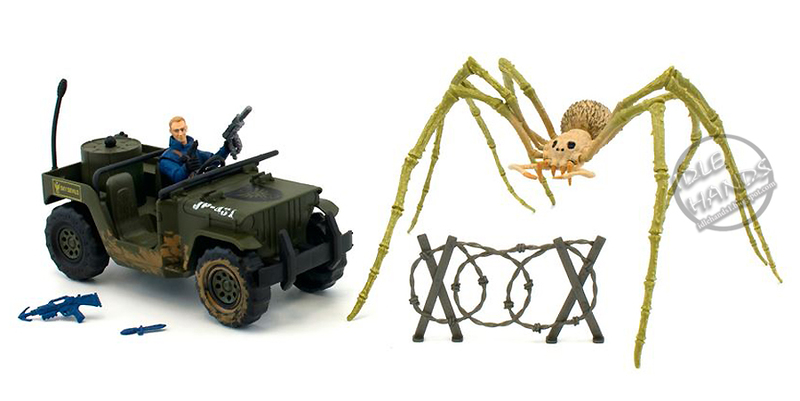 These toys confirm the presence of the Monarch organization introduced in the 2014 Godzilla film! Let the shared universe commence! WOW, Lanard is doing licensed toys now??!! Is that a first? The big Kong figure could use more articulations but the sculpt is great. Kong vs. Godzilla the toy battles will be epic. We knew that already for some time. That is the reason why this Kong is so much bigger than previous versions, so that he can have a chance against Godzilla. Speaking of which, this toy Kong is WAY undersized compare to the humans! Are those human sculpts just reused from whatever that budget army line is? I just caught something. Are any of those army dudes supposed to be Samuel Jackson and Tom Hiddleston? Oh wow, they totally are. Gotta say I am so glad Lanard has scored a major toy license. I hope they get more in the future. There's something wonderfully 80s about this line and I don't know why. Hope the movie makes the license worth it for them, though it seems like a bit of a demographic difference between the toys and the audience. Oh well, the big Kong is cool, but I was hoping for NECA to score it and have some Kong v Godzilla v Pacific Rim display. But I guess NECA isn't totally out of the realm of possibility yet? NECA said today they have no interest in toys for the movie. Im in need of a Kong, unfortunately this looks more like for kids instead of collectors. that's a shame. A lot of the creatures from this seem tailor made for NECA. It's weird how toy design seems to be DE-volving since the 2014 year or so. I had toys in 1980 that had better articulation than some of these, Kong is ridiculously terrible in that regard... not even any moving legs? And soldiers that are stuck to one pose? The spider does look impressive as do the vehicles. The Dino Monster makes me laugh, what the hell is that? It has no forearms, just two legs, yet managed to paint a skull pattern on its face? And whatever happened to the Pterodactyl, is it an unholy spawn of Chtulhu with all those tentacles coming out of its jaws??? Oh and the guy who comes with the pterodactyls has a hilariously bad cartoony "WHAAAAT???" face. I swear, the Chap Mei chinese bootleg GI Joe wannabees look better sculpted than this. Yeah, I too would think Neca would've wanted this license. Especially since it's supposed to be in the same universe as Godzilla, and their Luca figure was pretty sought after. Bummer. I'm keeping an open mind.. I'm pretty interested to see it. I'm curious as to how they'll give nods to Godzilla. So basically: Mostly rehashed Corps! stuff with some dinosaurs, a couple new headsculpts, and a big Kong. At TRU now from Animal Planet. Well I like it! I'm in for the creatures. Hopefully they'll fit in with my budget. 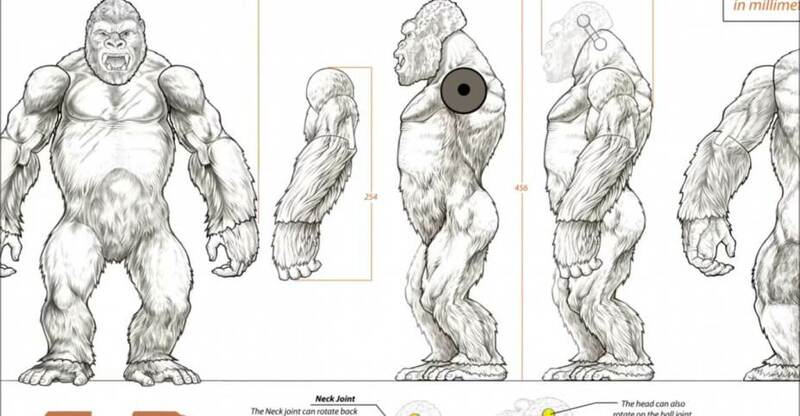 18" Kong could have used leg articulation, mainly to have a more natural gorilla pose (on all fours). That Pterodactyl thing looks like the Flood from Halo got to it first! Yeah, I think so too. Otherwise it's really nice sculpt and he have PAINT! tons of PAINT! TBH I am not sure how much the lack of leg joint would actually bother kids,like one of my most beloved childhood toys is "statue" dark purple~pinkish dinosaur. I have been saying it a lot too, to all those people who justify the overpriced unpainted hollow chunk of plastic, HOWEVER I think this Kong figure is ten times better then what we could have got today with Hasbro and Mattel! 1980's toys were great beacuse they were a lot of different toy comapnies and not the horrible monopoly of Hasbro and Mattel who "swallowed" so many great small toy companies and either ruined their brands or done nothing with it. So, ovarall this Kong is quit nice, not the greatest and I'm so happy that either Hasbro or Mattel got another license. UPDATE: The Kong figure cost about 45$, screw that. I was hoping for someone to make toys for Skull Island, but this isn’t exactly what I wanted. Interesting that Lanard is trying out licensed toys, but these are not great. 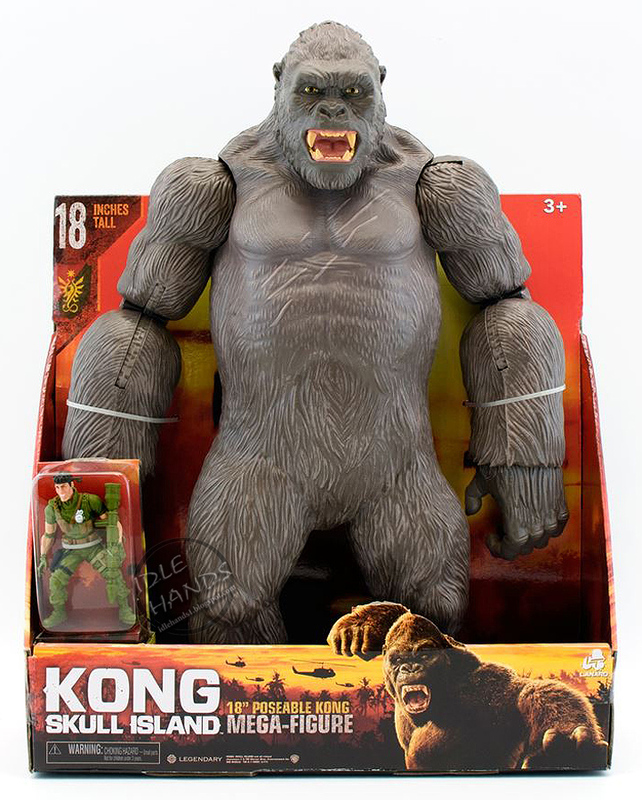 I might grab the Kong figure to go against the giant size 2014 Godzilla that Jakks made. The figure included with the lizard creature and the hut looks quite a bit like Samuel L Jackson if you look close. And the blonde guy driving the Jeep looks a lot like Tom Hiddleston.